On October 19, 2018, the Cornell Real Estate Council (CREC) was pleased to welcome alumnus Seth Klarman (CAS ’79) to the 36th annual Cornell Real Estate Conference as the keynote speaker. Mr. Klarman is the CEO of The Baupost Group, a privately held investment management company with approximately $30 billion in assets. 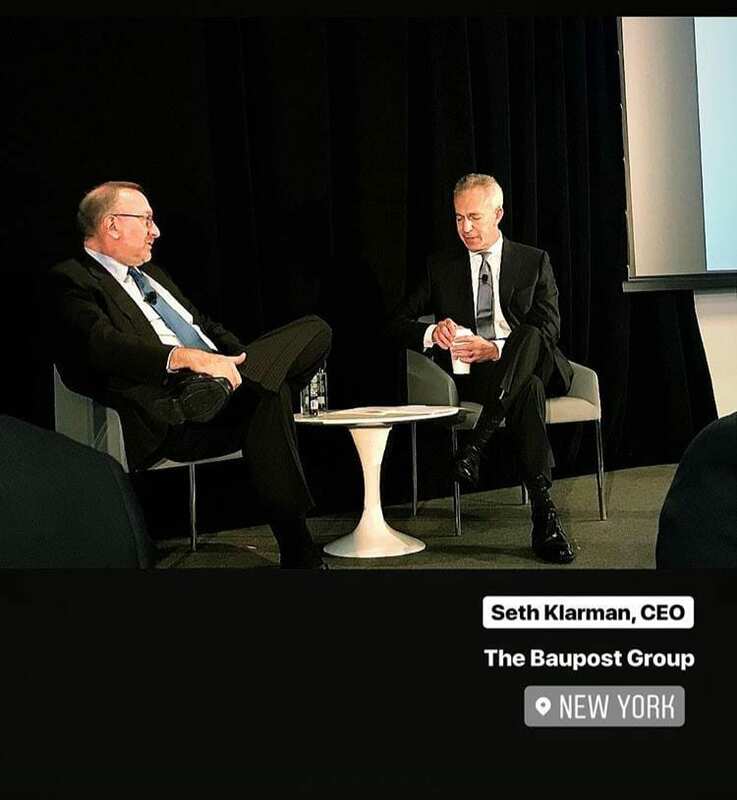 Mr. Klarman has been at the helm of Baupost since its founding in 1982 and is widely recognized as one of the most successful practitioners of value investing not named Warren Buffet. Not known for speaking publicly or granting many interview requests, Mr. Klarman sat down for a one-on-one discussion with David Hodes, Managing Partner of Hodes Weill & Associates. Mr. Klarman began by discussing how he was first drawn to value investing. Throughout his studies it was apparent that the idea of an efficient market was largely incorrect. Many opportunities exist within markets to take advantage of pricing discrepancies brought about by events that clouded the true value of many enterprises. This often leads one to assets that are unpopular or overlooked by the wider market and provides a “margin of safety” – a term coined by the “father of value investing” Benjamin Graham – that allows for assets or firms to be purchased at a discount to their intrinsic value. In other words, as Mr. Klarman put it, “why wouldn’t I buy a dollar for fifty or sixty cents?” While these types of investments typically tend to play out in distressed or ignored areas of a market deemed too risky, value investors in the mold of Mr. Klarman in fact see low risk opportunities. From a real estate perspective, value investing is more closely aligned with the idea of buying an asset for less than the replacement cost. Mr. Hodes then invited Mr. Klarman to discuss the current market. What lessons have we learned from 2008? How will this current market correct? Mr. Klarman noted that while you can worry from the top-down, you must always invest from the bottom up. The fundamentals of a deal should not change relative to the overall market – if it makes sense on an individual basis, the investment is merited. However, the current market is overextended on a cyclically adjusted basis and that is not necessarily the case nominally. Interest rates are below where they should be, a result of policies that were successful in stemming the fallout from 2008-2009 – but how do we pull out? As we move forward in what has seemed like a “benign decade” characterized by low defaults, narrowing credit spreads, and potential inflation, Mr. Klarman pointed to the writings of economist Hyman Minsky, more specifically his point that sustained periods of low volatility eventually lead to high ones. We have seen tremendous amounts of volatility recently internationally and while that volatility has largely shied away from U.S. markets, there will be a tipping point. However, what that point is, Mr. Klarman said, is unknown. While in the current market liquidity seems constant, it is one of those things that is always there – until it isn’t. According to Mr. Klarman, there are more dubious offerings today than ever and as large VC funds continue to grow ever larger (for example, SoftBank), things could change for the worse. Noting that many members of the audience were students, Mr. Hodes asked Mr. Klarman if there was any advice he may have for those interested in a career in finance. Mr. Klarman stated the investment business is bigger and more competitive now than ever and requires a 24/7/365 dedication. However, it is invigorating and meritocratic. The investing profession is not as cutthroat as it is portrayed and he encourages it is a pursuit. When Baupost looks to make new hires, it is looking for team players, stating “nobody’s name is on the door.” Outside the box, ideational thinking should accompany a strong ethical foundation. Being “intellectually honest” might be the most important part. In closing, Mr. Hodes asked how value investing might change in the future. Upon contemplation, Mr. Klarman stated that the core idea of value investing, a basic value concept, is the idea of mean reversion. However, this idea is less applicable today due to market disruptions from technology. Technology has the potential to change markets faster than humans may be capable of adapting. This will create problems in the future – but also potential opportunities. As a value investor, it is better to have a few opinions well founded, not opinions on everything. The Cornell Real Estate community would like to thank Mr. Klarman for his support of Cornell and for taking time to relay his knowledge and experience. We wish him continued success at Baupost and hope for more interactions in the future.